It sure has felt like fall the last few days. It’s been downright chilly and the trees are showing some wonderful colors. 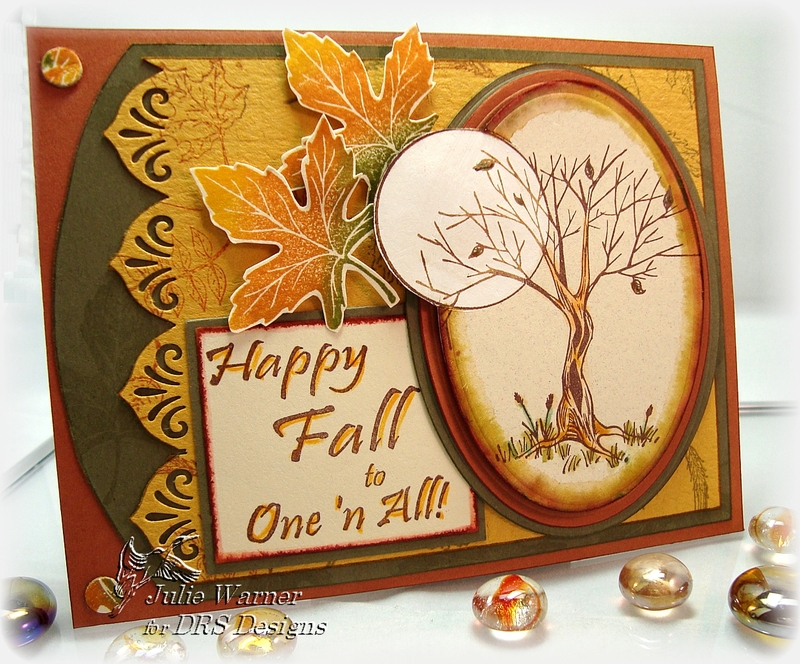 This card is for aColor Combo Challenge by Scrapmaster’s Paradise and it’s being sponsored today by DRS Designs! The colors for this challenge are Crushed Curry, Really Rust and Always Artichoke. What great fall colors! 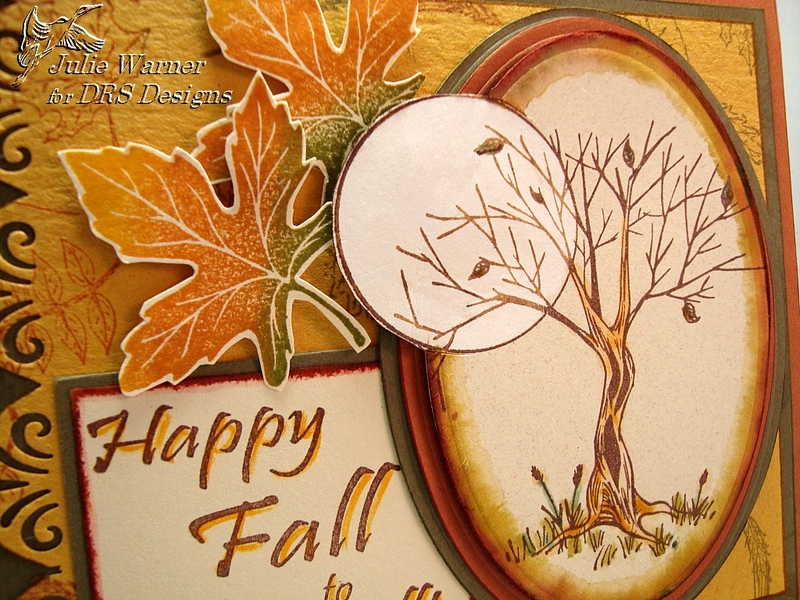 I’m using a brand new fall image, L070 Spooky Tree w/Moon along with E580x Happy Fall One ‘n All, D701 Medium Silhouette Leaf and H618x 2Fall Leaf Background. The tree was stamped on to vanilla c/s w/ the chocolate ink and I painted some bleach into the moon area. It was cut w/ a Spellbinders oval Nestie and a technique I came up with called Out of the Box Nestie. A little color was added w/ markers and after I edged it w/ the markers, I used a water brush around the edge to blur it.Â It’s attached to rust and artichoke ovals. The curry bg was stamped w/ the leaf background image and a combination of palm leaf and sienna inks. The edge was punched and it was attached to an artichoke layer w/ one rounded edge, then a rust layer. The greeting was stamped w/ the chocolate ink, then I used an ochre marker to trace the letters.Â Two leaves were stamped using the Kpad and cut out. I made two faux brads by using a 1/4″ hole punch on part of another stamped leaf and attaching them to pieces of punched cardboard. Thanks so much for stopping by! Be sure to check out the challenge! October Fan Club Gallery Sneak Peek! Round, round get around, I get around. That could be the theme song for October’s Dirty Dozen Gallery. I hope y’all are all members because it would be a shame to miss this fantastic gallery! 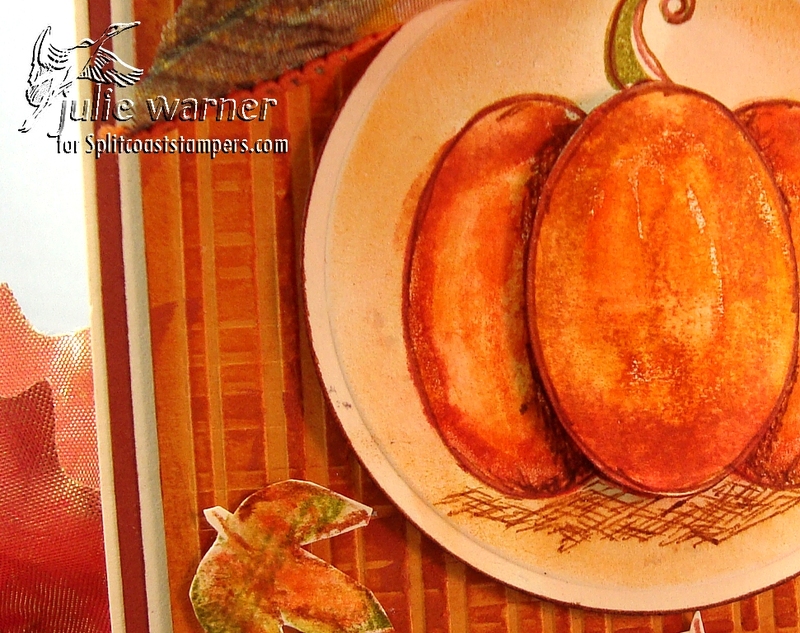 There are so many scrumptious projects this month-just in time for Halloween, Thanksgiving and Christmas. If you’re not a member, why not? It’s fast, easy, low cost and a lot of bang for the buck. You not only get to see the FC gallery, you get access to exclusive tutorials, templates and 24/7 uploading privledges. And you support the best stamping community around.Â Check it out here! You’ll be glad you did. Welcome to Day 3 of our 1st ever Christmas Card Extravaganza â€“ ISC Blog HopÂ (Final Day)! 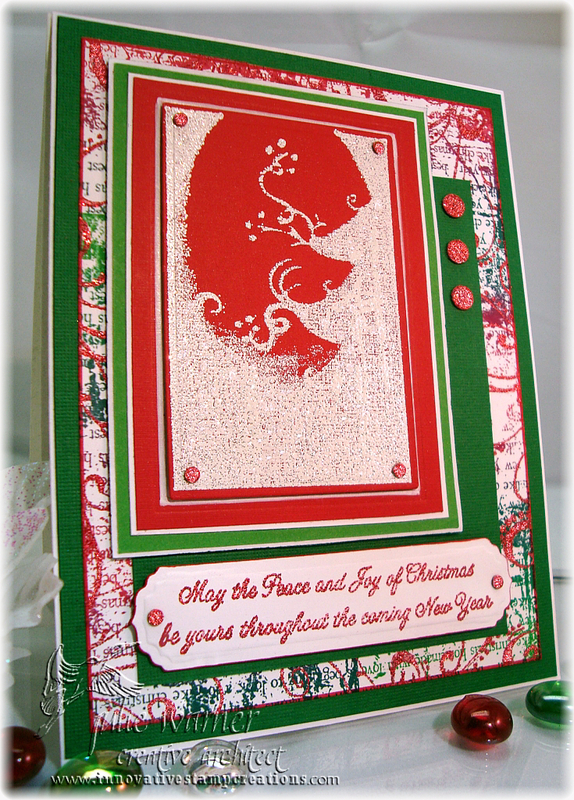 For my Glittering Tree Silhouette, I used the new sheet Eclectic Christmas. The tree profile was stamped w/ white pigment ink onto red linen c/s and embossed w/ a glittery white powder. I like the way the embossing looks on the linen textured c/s. I cut a frame using a Spellbinders nestie rectangle, edged the frame w/ a white marker, then inserted it back in its original place. It’s layered a few times alternating white and green. The distressed text background was stamped using a Kaleidacolor pad.Â The flourish image was overstamped and embossed w/ a red tinsel powder.Â I used cranberry pigment ink and this same red tinsel ep to do the greeting.Â A nestie long rectangle was used to cut out the greeting, then I used the end only of the label 4 to recut the ends. 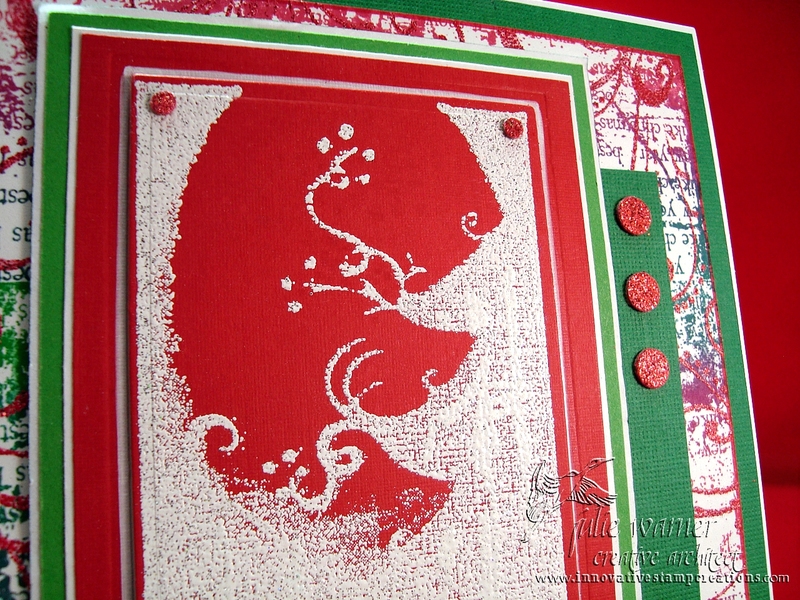 I used hole punches to punch out the red tinsel embossed dots to be used as faux brads. I hope you enjoyed this Christmas card and I know youâ€™ll love the beautiful cards the rest of the ISC Architects have created. ISC is also offering 10% off your order (good thru Friday 10/16) ! The Christmas Stamp Line is jam packed and for a limited time only the retail price has been reduced! To continue the hop, please click on over to view Joanne’s blog. Don’t worry, if you get lost, here is the blog hop order.